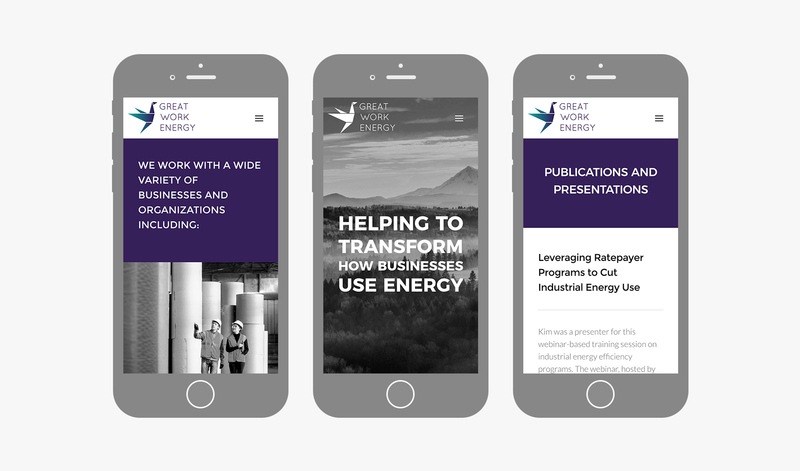 Great Work Energy is a consultancy upstart that specializes in partnering with companies to increase their energy efficiency. 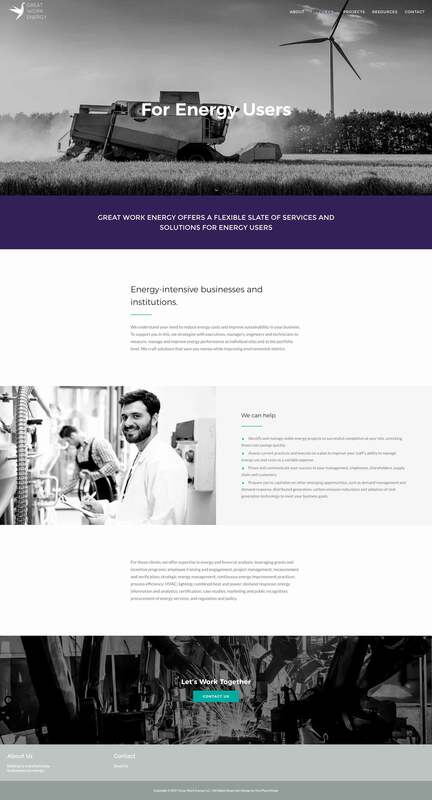 Founded by Kim Crossman, she works with businesses to help them reduce their energy usage and energy-related costs, keep up with energy usage industry standards, and potentially qualify for efficiency-related subsidies. 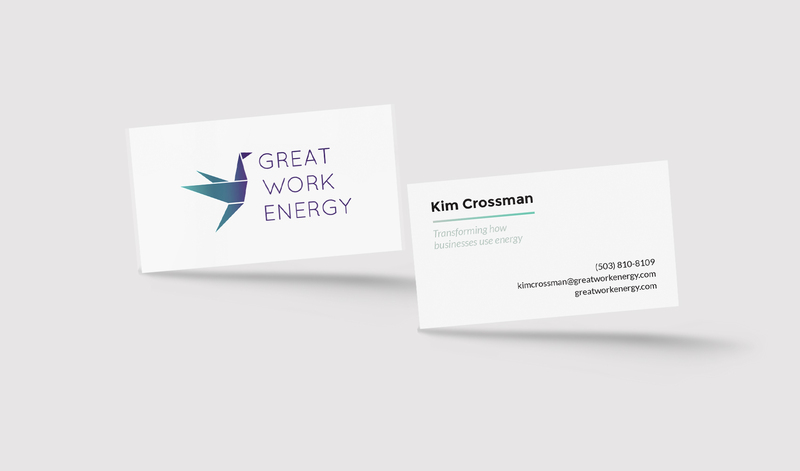 Although Kim had over 20 years of experience in energy management, this was her first business. She wanted to work with us to build a brand identity and website for her new business. Her goals for her brand identity were to set her business apart, be personally meaningful, resonate with her audience, and bring additional legitimacy and professionalism to her brand. Her main goals for the website were to present her services and past work in an easy to follow in a user-friendly manner, styled to reinforce her brand identity, and have a contact page so people who knew her from her previous work would be able to easily find her online. 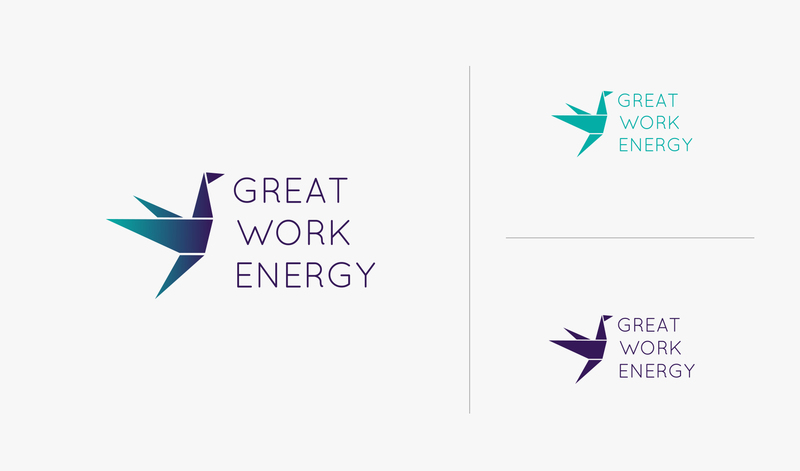 We worked with Great Work Energy to develop a corporate brand identity and WordPress website. We helped Kim build her brand identity to reflect who she is and what her company values are. We designed a logo that symbolizes change through the skillful application of effort, which led us to an image of an origami bird in flight. This, combined with the company name, visually communicated she has the necessary experience and expertise to help organizations make powerful and lasting change for the better–not only for their bottom line but also for the environment. For her website, we focused on highlighting her process and her experience. We brought on a professional copywriter to work with Kim to develop her content. The WordPress website showcased her wide variety of skills and services, as well as giving visitors an introduction to who she was. The styling reinforced her brand identity and all of the content was presented in a user-friendly, yet professional looking design to also help her stand out from her competitors. Post-launch, we provided a PDF reference guide as well as training so Kim could easily maintain the website herself. After a long career in large organizations, starting my own independent consulting business this year was exciting but overwhelming. I was just beginning to understand what it meant to have no support from legal, accounting, the IT help desk, the web, and marketing team. It was all going to be up to me. My first priority during launch was to develop the business brand, logo and website, something I have never done, and meanwhile, I was already beginning to get busy on my first contracts. 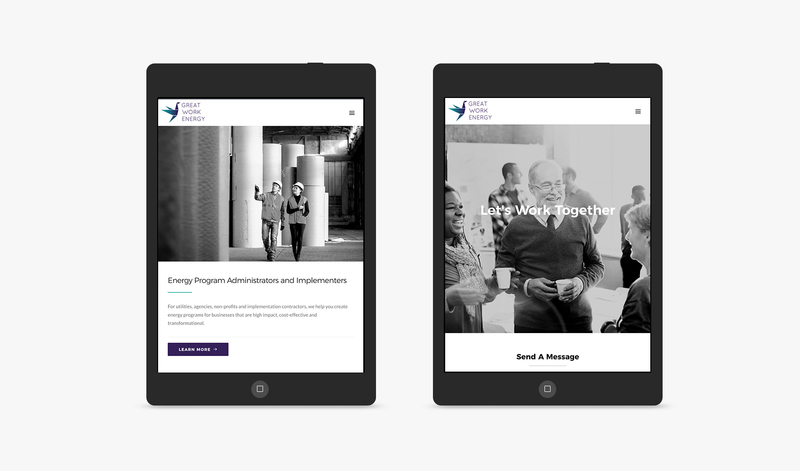 I learned about One Plum Design at a class for new small businesses, where a classmate shared her positive experience working with the One Plum team on a major redesign of her site. I met with them over the next few weeks to better define my needs, they laid out a plan and we quickly began a 3-4 month project together. Hannah and her team were very professional and easy to work with from start to finish. They communicated proactively, helped me manage my part of the work and met scheduled due dates throughout the project. They were also creative and sensitive in their design. I feel deeply connected to the logo, and the website is just right. It is relatable and informative for my potential clients and colleagues while also being beautiful to look at and reflective of deeper values. There were of course challenges along the way, my assignments were NOT easy, and I am deeply relieved that this first heavy lift of creating a business brand and website from scratch is over. Without even a formal business plan done yet, to build an effective website I had to decide exactly what it is I'm offering, to who, and how–big decisions. Then I needed to be able to express those things in clear, concise words, which forced the One Plum Design team to bring a sledgehammer and forklift to the writing part of the project. 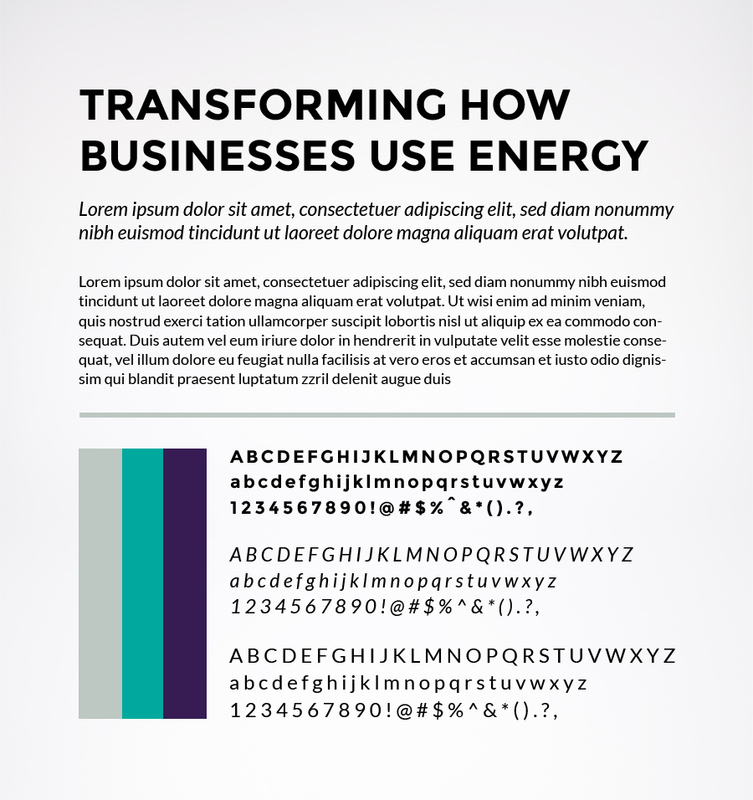 And now it's all on my website for the world to see at www.greatworkenergy.com Thank you Hannah and One Plum Design. I look forward to growing my small business alongside yours and working with you again in the future. "Starting my own independent consulting business this year was a bit overwhelming at first. It was difficult to adjust to being on my own and not having the available resources of a larger company. Hannah and her team worked with me to condense exactly what my business is and communicate that effectively through my branding and website. They helped me overcome one of the major challenges of starting a new business."